HOUSE (installation view), 2014. 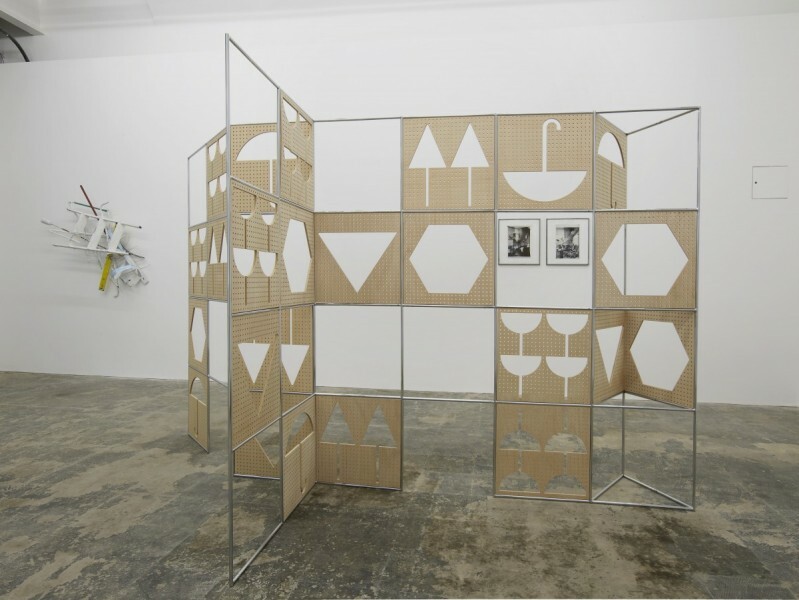 Belén Uriel, Good Companion Rooms (old and new side by side), 2011, inkjet photographs printed on cotton paper, 45 x 40cm each; Belén Uriel, Manual, 2012, nickel-plated tubular modular steel structure and okume drilled wood panels, 200 x 350 x 100cm; Lubaina Himid, Venetian Palace, 1997-1998, acrylic on canvas, 110 x 146cm; Karl Holmqvist, Give Posters a Try, 2013, A1 size wallpaper. Photo courtesy Hollybush Gardens, London. HOUSE (installation view), 2014. 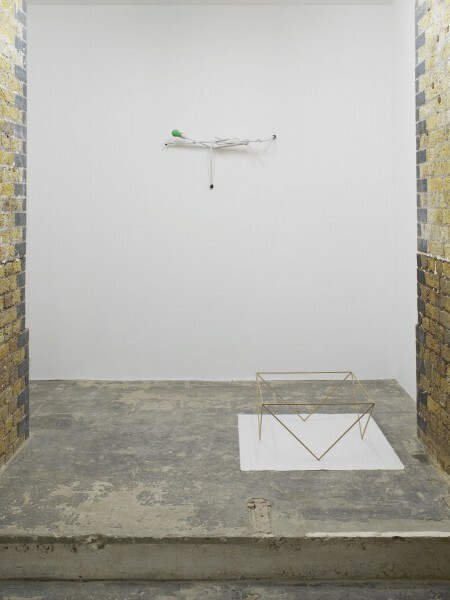 Anna Fasshauer, Glycin, 2013, copper tube laquer, cement bulb, 60 x 50 x 12cm; Belén Uriel, Tablemat, 2012, 5mm wood outline structure 28 x 55 x 55cm. Photo courtesy Hollybush Gardens, London. A late lunch, a quick detour to drop something at the framers, and then a solitary walk through the backstreets to Hollybush Gardens. These last days of June in London are warm and sultry; rain is coming. There is a quiet and stillness through the cobbled alleys that I associate with August jaunts to European cities. Smells of cooking, distant clatter of plates. Outside of pubs, tattooed hipsters head-to-head in earnest conversation; the occasional red-faced, middle-aged man furtively nursing a pint of bitter, hoping nobody notices he’s not at his desk; decorators in whites splashed with Farrow & Ball colours taking meditative fag breaks, leaning against sunny walls. Crop-haired builders finishing up a day servicing someone else’s building empire. Skirting through the dappled shade around St James’ Clerkenwell, a little browse in the jewellers windows on Clerkenwell Green, and just before the Roseberry Avenue viaduct on Warner Street, duck into Warner Yard. If you only associate fire escapes with New York, prepare to be impressed by a bravura display of 19th century cast iron soaring up several stories. Since October last Hollybush Gardens’ new home is a former industrial building that rambles pleasingly, offering four different interconnecting spaces of sympathetic proportions and airily high ceilings. In a long tradition of summer group shows, HOUSE proposes a variety of takes on a theme: an international array of buildings civic and domestic as well as some intriguing objects riffing on furniture or interior fittings sit easily alongside each other. 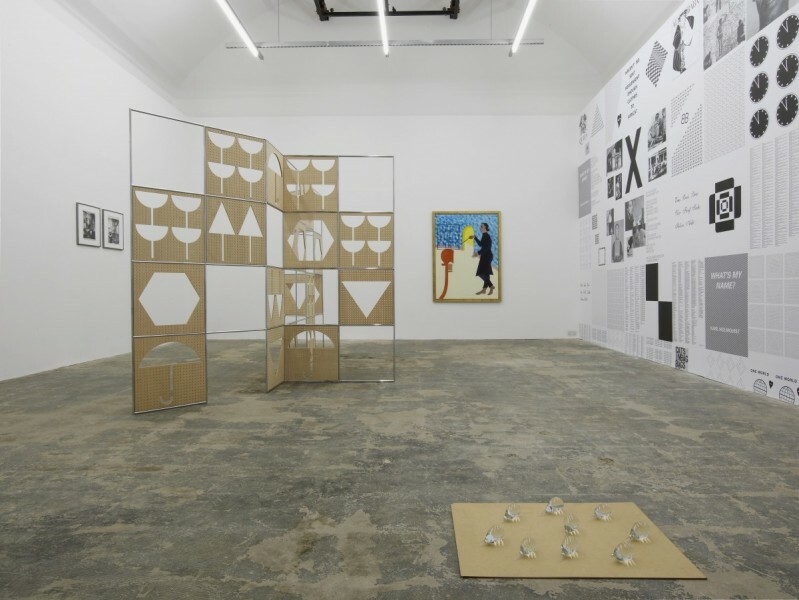 The painter Lubaina Himid is here with canvases that present imaginary architecture by imaginary black women; part of a project from 1997-78 called Architects, Models, Plans they extend her practice of proposing moments when black women could alter history. Also politically inflected is the black and white video by Karl Holmqvist that is showing on a monitor with headphones. With a great soundtrack composed by Jay Chung, the film presents repeating sequences of photographs of post-war public housing in Germany. Seductively modular elevations with grids of windows and minimal geometric detailing, these plattenbauten sprang from an impulse towards a democracy of design that in 2014 seems at the same time familiar and quaint. Belén Uriel also plays with modernist design values, but this time through constructions that explore elements of furniture. A large screen in the main space has cut-out motifs taken from the stencilled markings familiar from art packing cases: an umbrella to indicate “keep dry”, arrows to indicate which way is up. Out near the staircase, a fragile wooden piece appears to mimic the steel supports of an Eames occasional table. Anna Fasshauer has two wall based works, combinations of painted copper tubing, cement and found objects, one of which is titled after the neurotransmitter serotonin, alluding to the powerful psychological effect that our environment has on us, perhaps. In the smallest space is the two-screen film piece LC in the Bijlmer by Falke Pisano and Luca Frei. 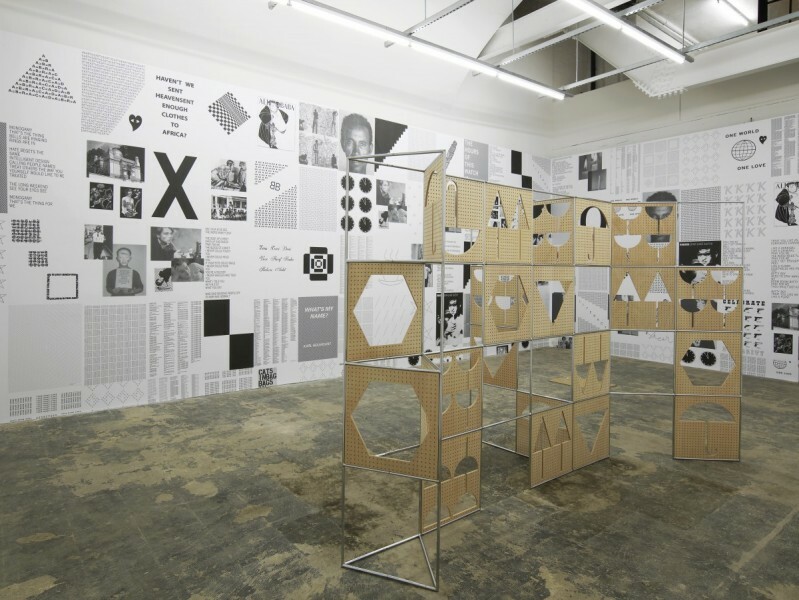 The voiceover, spoken by the artists, describes an abortive project to design a pavilion commemorating the work of Brazilian artist Lygia Clark. Whilst the commission fell through the artists decided to continue to develop the design, and the result is a combination of CGI with still images to reference real buildings that informed their thinking. As we watch London seethe with activity through another insane property boom, a show like this is a little corrective to our overriding obsession with buying, selling and building.